OSIAS, Camilo, a Resident Commissioner from the Commonwealth of the Philippine Islands; born in Balaoan, La Union Province, Luzon, Philippine Islands, March 23, 1889; attended schools in Balaoan, Vigan, San Fernando, and was appointed a government student (pensionado) to the United States in 1905; B.A., Western Illinois State Teachers College, Macomb, Ill.,1908; attended the University of Chicago, Chicago, Ill., 1906-1907; B.S., Columbia University, New York, N.Y., 1910, earned graduate degree from Columbia University Teachers College, New York, N.Y., 1910; teacher; author; academic supervisor of Manila, P.I., public schools, c. 1910-1916; first Filipino superintendent of schools in Bataan & Mindoro provinces, P.I., 1915-1916; assistant director of education, Philippine Islands, 1917-1921; member of the first Philippine independence mission to the United States in 1919; lecturer, University of the Philippines, Manila, P.I., 1919-1921; president, National University of the Philippines, Manila, P.I., 1921-1934; member of the Philippine senate, 1925-1929; elected as a Nacionalista to the Seventy-first Congress to a three-year term and reelected to two succeeding terms, served until his term expired in accordance with the new Philippine commonwealth government (February 7, 1929-January 3, 1935); unsuccessful candidate for election to the Philippine senate in 1934; member of the Philippine constitutional convention in 1934; member of the Philippine national assembly, 1935-1938; member of the economic mission to the United States in 1939; chairman of the Philippine educational mission 1938-1941; chairman of the Philippine national council of education, 1941; director of publicity and propaganda, 1941-1942; chairman of the Philippine national cooperative administration in 1941; assistant commissioner of the department of education, health, and public welfare, then minister of education of the Republic of the Philippines under Japanese occupation, c. 1941-1945; chancellor of Osias Colleges, Tarlac, P.I. ; member of the Philippine senate, 1947-1953, 1961-1967; served as minority floor leader, majority floor leader, president, and president pro tempore; Philippine representative to the Interparliamentary Union in Rome and to the International Trade Conference in Genoa in 1948; unsuccessful candidate for the Nationalist Party nomination for President of the Philippines in 1953; died on May 20, 1976, in Manila, P.I. a Resident Commissioner from the Commonwealth of the Philippine Islands; born in Balaoan, La Union Province, Luzon, Philippine Islands, March 23, 1889; attended schools in Balaoan, Vigan, San Fernando, and was appointed a government student (pensionado) to the United States in 1905; B.A., Western Illinois State Teachers College, Macomb, Ill.,1908; attended the University of Chicago, Chicago, Ill., 1906-1907; B.S., Columbia University, New York, N.Y., 1910, earned graduate degree from Columbia University Teachers College, New York, N.Y., 1910; teacher; author; academic supervisor of Manila, P.I., public schools, c. 1910-1916; first Filipino superintendent of schools in Bataan & Mindoro provinces, P.I., 1915-1916; assistant director of education, Philippine Islands, 1917-1921; member of the first Philippine independence mission to the United States in 1919; lecturer, University of the Philippines, Manila, P.I., 1919-1921; president, National University of the Philippines, Manila, P.I., 1921-1934; member of the Philippine senate, 1925-1929; elected as a Nacionalista to the Seventy-first Congress to a three-year term and reelected to two succeeding terms, served until his term expired in accordance with the new Philippine commonwealth government (February 7, 1929-January 3, 1935); unsuccessful candidate for election to the Philippine senate in 1934; member of the Philippine constitutional convention in 1934; member of the Philippine national assembly, 1935-1938; member of the economic mission to the United States in 1939; chairman of the Philippine educational mission 1938-1941; chairman of the Philippine national council of education, 1941; director of publicity and propaganda, 1941-1942; chairman of the Philippine national cooperative administration in 1941; assistant commissioner of the department of education, health, and public welfare, then minister of education of the Republic of the Philippines under Japanese occupation, c. 1941-1945; chancellor of Osias Colleges, Tarlac, P.I. 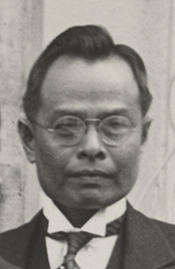 ; member of the Philippine senate, 1947-1953, 1961-1967; served as minority floor leader, majority floor leader, president, and president pro tempore; Philippine representative to the Interparliamentary Union in Rome and to the International Trade Conference in Genoa in 1948; unsuccessful candidate for the Nationalist Party nomination for President of the Philippines in 1953; died on May 20, 1976, in Manila, P.I.